If you like Mickey Mouse, cars, and adventures, then the page of the Mickey and the Roadster Racers Games category, which is this one, is the right place for you! 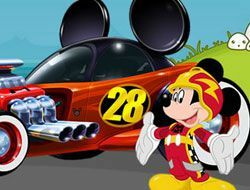 We invite you to try any of the Mickey and the Roadster Racers Games on this page right away, and we are sure that you are going to love playing them from the get-go. Good luck! The Mickey and the Roadster Racers Games category was created in 17.09.2016 and from there we added more than 9 games for boys and girls that are interested in gaming online. These games were voted in total 83 times and the best game from Mickey and the Roadster Racers Games it's Mickey and the Roadster Racers Bejeweled. 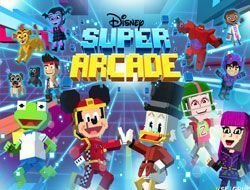 We recommend you to play the latest game added in this category on 22.01.2019 which it's Disney Super Arcade. If you want Mickey and the Roadster Racers Games, just click here. 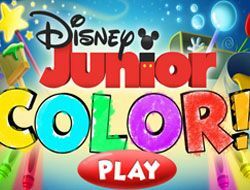 In 2017, on Disney Junior, we are going to be able to see the return of Mickey Mouse, Minnie, Pluto, Goofy, Donald, and Daisy, in a brand new series for kids with lots of adventures, and this time, cars as well, a show called Mickey and the Roadster Racers, which we can't wait for fast enough! In anticipation of the release of this show, our team has decided to create the Mickey and the Roadster Racers Games category, knowing full well that once the series premieres, and even a short time before that, there are going to be countless of children searching the internet for Mickey and the Roadster Racers Games to play, because who doesn't want to play online games with their favourite characters? Especially if we talk about well-known and beloved characters like these ones, who have been a staple of Disney since it's beginning. 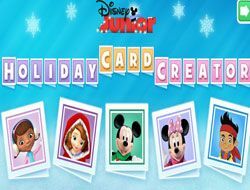 The Mickey Mouse Clubhouse show, which can be considered the predecessor to this one, has aired for many years and has been enjoyed by countless of kids all over the world, so that makes us belive the same is going to happen with this series. While there is not that much information currently available on the show, we still want to put you up to speed before you start playing Mickey and the Roadster Racers Games, because we are sure that some of you would like to know, so if you do, you just keep reading the description, and everything we know we will share with you! The six main characters are going to be called the Sensational Six, and they will not stay only in their hometown of Hot Dog Hills, but go all around the globe. What will they do there? Well, they are going to used their humerous vehicles to take part in all sorts of races. Each characters has their own car, which has a very funny and unique design, which you can find on no other car. The show is not only going to allow kids to watch awesome adventures of these characters, but they will also help children learn about important things like friendship, teamworkd, and good sportsmanhip. We are sure that there is going to be no child who does not enjoy this series, which we hope is also going to be true about the Mickey and the Roadster Racers Games on this page, which we recommend in their entirety to you all. 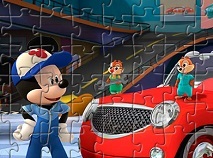 So far, in this category, because when we have created it there was not much information available, you can only play a game called Mickey and the Roadster Racers Bejeweled, but we are sure that it will only be the beginning, and it will follow with puzzle games, differences games, skill games, and many other formats, so that you will never ever get bored whilst on this page. Well, that's about it, so once again, we highly recommend you start playing the Mickey and the Roadster Racers Games on our website right now, and have a most wonderful time, like you can always do on our website!